We caught up with the K-pop sensation while he was here in Manila for his recent album launch. Learn more about him and see up-close pics! Armed with talent, flawless looks, and a heart of gold, there's nowhere but up for Korean pop star and heartthrob Kim Hyun Joong, who continues to win hearts the world over. He's famous for being the leader of Korean idol group SS501, but his career (and his universal charm) really skyrocketed after playing the role of Yoon Ji Hoo in the hit K-soap Boys Over Flowers. He also played Baek Seung Jo in his recent drama Playful Kiss, which was also a huge hit. It's been one year and two months since his Manila fans first swooned over the star in the flesh. (He last visited for a sold-out concert where he raised and donated funds to benefit the Abiertas House of Friendship, a center for unwed pregnant mothers.) To our delight, the 25-year-old hottie graced Manila shores once again last August 25 to promote his first solo mini-album "Break Down." We caught up with him at a press conference at EDSA Shangri-La Hotel, and on the same day, he launched his album via a "High-Five Touch" event at the TriNoma Activity Center in Quezon City. The album launch was a huge success. Even before the mall opened, kilig fans were lined up outside--waiting to get their copy of "Break Down" and meet the Kim Hyun Joong, of course! The first 500 who purchased the CD even got to exchange high-fives with the cutie! "Break Down" marks Kim Hyun Joong's comeback to the music scene, this time as a solo artist. The album is a mix of musical genres, from heavy urban dance tracks to strong R&B and even bubble gum pop. For his solo debut, he shed his pretty-boy charm for a more mature, masculine one. He told us he has plans to do an Asia concert tour that will include Manila as a pit stop! We'll be looking forward to that, for sure! At the press conference, he told his fans, "Thank you for all the love you have toward me. It inspires me to bring up better songs and better performances." Proving to be a huge hit in Asia and beyond, Kim Hyun Joong is shining brighter than ever as an international star. 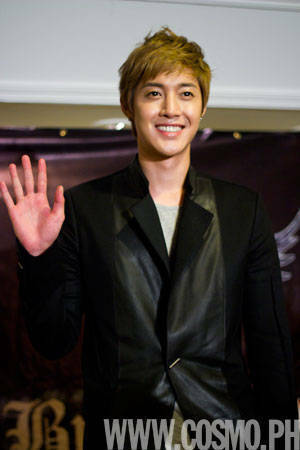 Launch the gallery to see photos of the gorgeous Kim Hyun Joong from his press conference! Kim Hyun Joong's solo mini-album "Break Down" is available in all record bars nationwide, exclusively distributed by PolyEast Records in cooperation with KeyEast Entertainment and CJ E&M Korea.